RS8 began life as a traditional British saddle tank (steam) locomotive built by the Avonside Engine Company in 1923 for a quarry in North Wales. 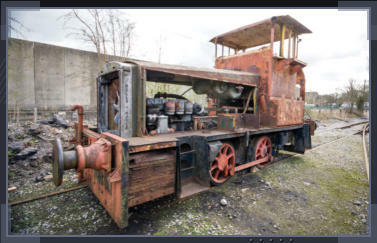 The loco spent most of its working life at Tunstead Quarry in Derbyshire. In 1959 it was selected to become a unique conversion from steam to diesel, being totally rebuilt within the quarry workshops. It operated successfully within the quarry for the next decade. In 1972 it was donated to a railway preservation group based at Dinting, near Stockport. In 1992 the loco was passed to another group at the National Stone Centre at Wirksworth, Restoration began but the locomotive was sited in an insecure area next to a public footpath and vandalism and theft thwarted the efforts of the restorers.